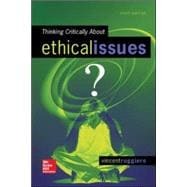 Thinking Critically About Ethical Issues invites readers to apply ethical principles to issues that exemplify the kinds of moral challenges encountered in everyday life. It provides an overview of the need for ethics and then focuses on strategies for effective decision making. Ruggiero emphasizes doing ethical analysis rather than comparing ethical theories. The history of ethics is covered in the concluding chapter.